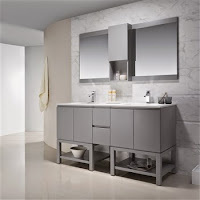 Bathroom Vanities blog: One Sink or Two - Which Is Right for Your Bathroom? One Sink or Two - Which Is Right for Your Bathroom? When it comes to a remodel, making the decision to add a bathroom sink can be tough. There are many benefits to having an additional sink, but it also can mean sacrificing valuable counter space. As much as you would love to say goodbye to the days of waiting for one person to finish brushing their teeth so you can wash your face, it’s important to be aware of the realities of having a double sink. Personal Space - The most obvious advantage of having Jack and Jill sinks is that you and your partner, or whoever you share a bathroom with, each have your own personal sink. The days of waiting for one person to finish with the sink will be long gone. You can now line up your bathroom products on your side of the room without feeling like you are taking up too much of the other person’s space. Utilizing Space - If you have a spacious bathroom where wide open areas are going to waste, then it makes sense to install a double sink. You’ll love the convenience of having two sinks to speed up getting ready for the day. Cost - Another sink means another pipe being installed underneath your counter top. An additional pipe can mean higher water and plumbing bills. Space - While having two sinks does give you your own personal space, it takes up a large amount of counter space. Depending on the size of the sink that you decide to install, you will have to sacrifice the space that you once had there. This can lead to your sink looking more cluttered if the surface isn’t large enough for two faucets to begin with. More counter space - Depending on the type of sink you decide on (this wouldn’t apply to a stand-alone sink) you will have more space to move your things. 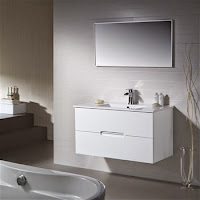 It’s especially nice to have space around your sink to place cosmetics and other bathroom supplies while you get ready. More storage underneath - With two sinks, you have to install an extra pipe, which takes away from the cabinet storage underneath. With a single sink, you can keep all of your cleaning supplies and bathroom products in the cabinets without having to work around an extra pipe. When you begin remodeling your bathroom and want to add a sink, consider these factors. While there are a variety of styles available and every bathroom is different, you can still make the best decision for your home by looking at the disadvantage and advantages of every option. Stop by one of our three Miami-area locations to view our one and two-sink bathroom vanity models. We have everything you need to make your modern bathroom complete. We are renovating our bathrooms and we are confused about choosing basin and sink, as they are available in so many styles and realizing which one is best for our bathroom is so difficult. your blog is helpful in letting us aware bout the benefits of different types of sinks. Locate and repair the source of the flood. Remove any remaining standing water (Water Extraction). Survey the area and create a full scope of work.